Insanely, bizarrely, and to their own detriment-- rather than successfully copying this, Apple's competitors have largely ridiculed the idea of having satisfied users. Everyone-- even Apple haters-- agree that Apple has attracted a different class of customer than Samsung, Xiaomi, Google, Microsoft or any other major tech brand. 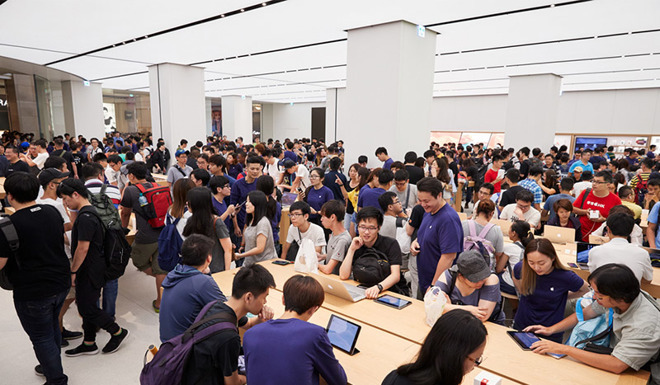 Those firms have even openly mocked Apple and its customer base in advertisements that ridicule Apple's fans for everything from standing in line for the latest new product to simply being part of a large mainstream user base-- such as having white EarPods. Any company that can effectively establish a relationship of trust with-- and appreciation from-- a significant population of buyers is generally considered to be doing all the right things: developing a great product that consistently delivers an exceptional experience, and then being there to provide helpful support whenever something goes wrong. As personal computing grew from a relatively small group of technically savvy early adopters in the 1980s into a virtually ubiquitous role serving everyone from children to their grandparents and from auto mechanics to artists and politicians, the attractiveness of Apple's approach-- to making technology work for "the rest of us" and curating the experience so that every piece of software worked similarly and was generally intuitive to get started with and become productive-- has given the company a unique position. Beyond simply taking over existing roles in the personal computing market as demand moved toward mobile devices, Apple also created the secure-- and extremely lucrative-- software market that Microsoft was unable to successfully create for Windows PCs. Apple has also adeptly expanded into new form factors of computing, from watches to audio and other peripherals that Microsoft wasn't very successful in introducing or selling to its PC user base. 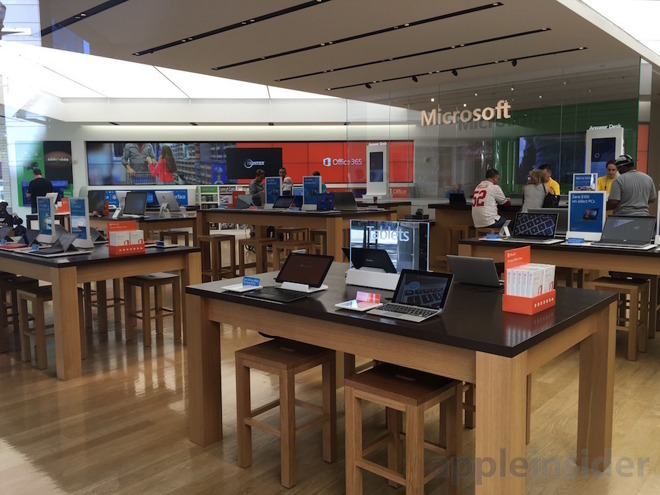 Compared to the PC experience under Microsoft, Apple has created an ecosystem, platform and installed base of users that is not only far more profitable but also vastly more loyal and sustainable. Despite waves of intense competitive pressure from the entire world's PC makers, consumer electronics firms, phone makers, and most recently watchmakers and audio vendors, Apple is not in danger of bleeding away any significant number of customers-- largely because Apple works to maintain such high user satisfaction rankings. The installed base of Windows users is roughly comparable to Apple's installed base of iOS and Mac users-- around the one billion mark-- but Apple is generating far higher revenues and profits, and its successfully launching new product categories and selling huge volumes of premium hardware. They also buy iPads, rather than expecting to get a free Android tablet; they buy Apple Watches; they buy apps and subscriptions on a similar 4x multiple-- so about half as many users are buying twice as much stuff in the App Store; they even buy premium Mac notebooks and desktops that have no real Android alternative. Google is struggling to sell Chromebooks the same way it ineffectually sells too few Pixel phones to matter. Google can't sell any meaningful number of its supposedly huge "installed base" on its fancy Pixel hardware; it can't get them to upgrade in any sort of meaningful fashion, and it can't even sell a large percentage of them on its cloud services or software marketplace. And for most of China-- the world's largest mobile device market-- it's blocked from even offering its core ad-supported services. If Samsung, which has long represented about half of all Android shipments, couldn't build a defendable base of loyal Galaxy users, how can the sloshing tides of various Chinese mass producers support the creation of a loyal base of uses when there is such intense commodity pressure for consumers to shift to a cheaper brand-- given that all of them are little more than iPhone knockoffs anyway? Google is now spending incredible amounts of money on custom Image Signal Processor silicon for its Pixel phones, resulting in awards and fawning media attention. But it's not resulting in real sales. And everyone else is also investing tons of money into computational photography, including Samsung, Huawei (on its custom Kirin chips), Qualcomm (on its Snapdragon chips it's selling to Pixel rivals) and of course Apple-- which is maintaining a lead in video, Portraits, Augmented Reality and other imaging tasks, not just in creating nice still photos. Even Google-- which formerly introduced its own, very different vision of the smartphone and promoted ideas of open community development and decentralized innovation-- has totally abandoned all notion of ideological Open Source purity to push out its own iPhone-copies using closed, proprietary camera features offered at the same premium prices of Apple, with virtually identical marketing and retail strategies. Just as with Samsung and Microsoft, all it took was years of failure to realize that its own ideas were worthless and that it needed to copy Apple to have any shot at success. Yet despite many strident efforts to be as much like Apple as possible, none of these companies-- not even Xiaomi, the supposed "Apple of China"-- have been able to achieve anything like Apple in building an App Store or services or selling accessory hardware, watches, headphones, or even tablets. 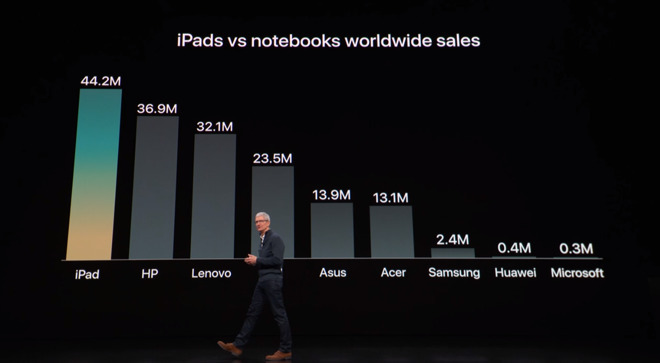 A primary reason for the abject failure of Microsoft, Google, Samsung and Chinese producers (such as Huawei and Xiaomi) to replicate the success of Apple in building a powerful user base is that they have been coddled by the tech media into thinking that fawning media attention and an excited endorsement of misleading unit sales figures and "market share" are valuable. As the next segment details, they really are not-- and certainly no replacement for building a relationship of security and trust with buyers. DED is using the Bazooka to blow away Android folks! Awesome! Google is an advertising company. Pixel phones and Chromebooks are a dot on the balance sheet. Microsoft is a cloud services company. Windows on PCs is no longer the big driver of MS profitability and Office is now a subscription service agnostic to platform. Apple has been a hardware company that is trying to transition to a services company as there is a limit to how high you can drive the average selling price without hitting the point of demand destruction. 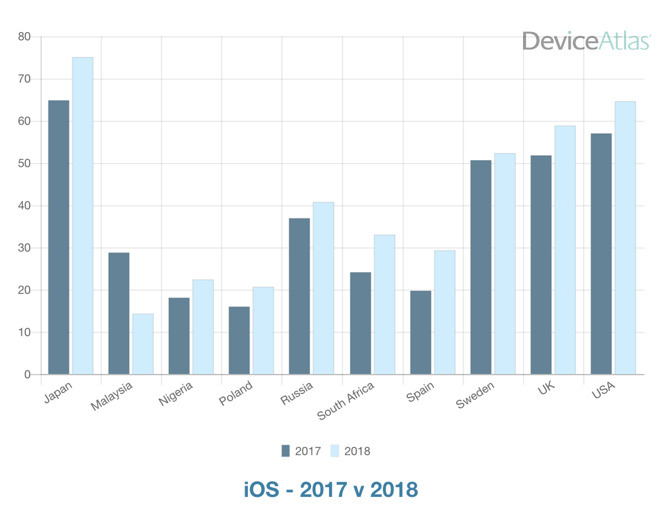 Going forward Apple is counting on a growth in services and some advertising to offset the plateau in hardware sales. The question regarding Apple is can they make serious inroads selling services- an area where their record is less than stellar. What Apple makes on music rentals probably could not pay the company’s light bill. Where is Apple’s platform agnostic equal of Office? Where is their equivalent of and MS Azure? Or AWS? After how many years and how much money, Apple has not been able to translate almost a billion iTunes accounts to 1/10th of that for Apple Music. Is iCloud ever going to move beyond the small potatoes it currently serves? Even Apple uses Amazon to host iCloud. The Apple I invested in years ago was a very different company from the elephant Tim Cook has created that has a lot of tail and not much tooth. The rent is paid by things inherited from Steve Jobs tenure and innovation has been largely replaced by iteration and imitation that makes the company look increasingly like Microsoft under Steve Ballmer. So who is Apple’s Satya Nadella? Funny how the author doesn't mention design on his article (only once). Apple is so successful because they put design first on every aspect. Their hardware gets better because design pushes manufacturing, their user interface/experience is designed on every step, their engineering advances because of design demands it, their integration is great because is designed around user needs, etc. You guys should take a page from Apple's book and invest a bit on design for AppleInsider. 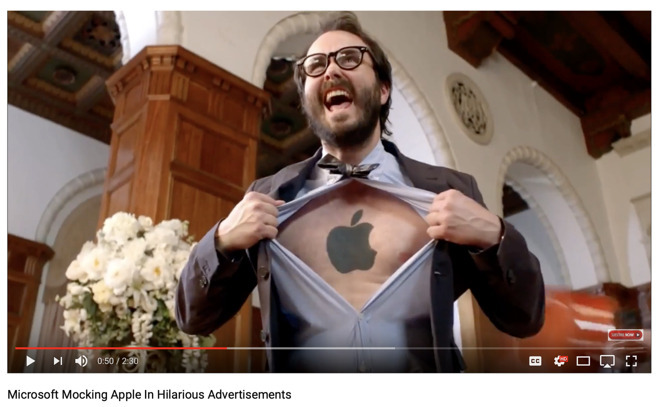 The only thing your web-page, podcast, YouTube videos, and app have in common is the name AppleInsider. Create a strong branding that all your products can follow and you'll see how much better they'll perform on each platform. Troll drivel. Welcome to the block list. Writing in bold does not make your story believable. Trust me, I tried. A bit rash to silence? Some interesting counterpoints at the very least. Perspective is important in any conversation. Sigh! It’s becoming less affordable as time goes on. The $449 phone is dead. Apple needs to reevaluate this. They want sales in India to offset what’s happening in China, but have no phone there that more than a wealthy few can afford. They can make them, if they want to. More troll trash Lol. Simply put...Apple makes great products and stands behind them. An old method but no necessarily the cheapest anymore. If AI tells us that the Apple products are affordable luxury, what excuse does anyone have to claim that they are unaffordable luxury? I suspect that 2019 will be the year that Apple realises that their price rises went a step too far. No different than a BMW or Mercedes. They live at the top of the class, more people can afford it. Comically all of their major competitors have the same price or even more expensive products that are a year behind them in tech from processors to facial recognition and security, but I never, ever hear their fans on here complaining about it. I think that speaks volumes about who theses people really are. It’s not difficult to be an Apple eco member and also be budget conscious. 2018 iPad $329 and often available for much less is a great example. Non flagship but very powerful iPhones are available new for much less than the top tier. A brand new nice MacBook Air is not off the charts expensive. I have never bought a Mac laptop brand new, had six over the years, and presently have a 2008, 2009, and 2011 that never fail. By staying just a few years behind in the used market one can have a reasonably powerful Mac for a fraction the cost of new. This customer is very much valuable to Apple. We subscribe to Apple Music, iCloud storage, and purchase apps through the App Stores. I would not have a use for a Windows computer if someone gave one to me. I spent too many years in the past having to constantly repair startup files just to get the damned thing to boot. LOL. How many decades ago was that? Windows 10 is pretty much bullet proof on decent hardware. My Mac is the best Windows 10 machine I've ever owned. I'd never go back to a Windows-only PC. Running Windows as a virtual machine on MacOS is the best thing ever for those very rare times I need to run Windows. WinTel hardware is still as much garbage now as it always has been when I was rolling with that crowd. I will take your word for it. It is nice to know it has improved.